LiveAdvice Chat is an instant messaging interface similar to other live communication applications used across the Internet. It allows real-time conversation between two members of LiveAdvice. Once a chat has been initiated, either user can enter text, which will then appear on the other user's monitor. What are the technical requirements for LiveAdvice Chat? LiveAdvice Chat uses your browser, and does not need any special software or downloads. Your browser (and any toolbars you may have enabled) must allow pop-ups from LiveAdvice.com. We support current versions of Internet Explorer, Firefox, Chrome and Safari. If you are not running a current (or near-current) version, we strongly suggest you upgrade your browser. How do I find advisors who offer chat? There are many ways in which you can discover advisors who offer chat; the simplest is to visit any topic of interest on LiveAdvice and select the "via Chat" tab. This tab lists all advisors within that topic who offer chat on their listing. You'll also see a "Chat Now" (or "Chat Later", or "Busy Chatting" depending on the availability status of the advisor) button on the advisors' listings (if they offer chat). Are the prices the same to call or chat with an advisor? Each advisor sets their listing rates on LiveAdvice. The rate is the same for calls and chat. Are there rules and regulations related to using LiveAdvice Chat? Yes indeed. Please review the LiveAdvice Chat Policy. 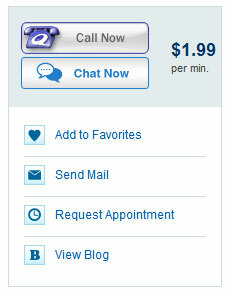 How am I billed for an online chat session? It’s easy – we do it the same way as calls! If you have any free minutes with the advisor, those are used first. Then you can add money to your LiveAdvice account, and use those funds to pay the advisor's per-minute rate. Does the advisor know when I am typing a message? Absolutely. Each user knows when the other is typing a message as system text displays letting you know. If no one is typing, then no system text will appear stating such. Can I leave feedback for a chat session? Yes! We encourage leaving a rating and written feedback. Learn more about leaving feedback. Can I read my chat messages later? Yes. A transcript of all chats is available from your transaction details page. How do I know when my account is low on funds? LiveAdvice will display an alert when you have one minute remaining. Once your funds are exhausted, the session will pause while you replenish your account, after which the session will resume. How do I end a chat session? You can end your session at any time by clicking the "End Chat" button. The cost of the chat session will be deducted from the balance of your LiveAdvice account. Can I chat and talk to an advisor at the same time? No. You can either be in a chat session or on a phone call with the advisor but not both. Is LiveAdvice Chat available outside of the US? Yes, it sure is. Please review the list of countries where LiveAdvice is currently available to see if your country is listed. If I’m chatting with an advisor, how do I call them? Simply click the "Call Now" button in the chat window. Is LiveAdvice Chat compatible with SMS, AIM, Yahoo Messenger, MSN, ICQ, etc.? No. LiveAdvice Chat is a proprietary system that's fully integrated with your LiveAdvice account and preserves the privacy of both the Advisor and the Customer. Therefore, it is not compatible with other instant messenger networks or client applications. What are the supported languages by LiveAdvice Chat? LiveAdvice Chat does not translate into any other language. The words (language) you type will be exactly what the advisor will see. Should you and the advisor both speak Spanish, or French, or another language, feel free to converse in that language. The LiveAdvice Chat system supports all languages as long as both you and the advisor have the appropriate language packs installed on your computers. Why did my session end suddenly? Occasionally, a session might end suddenly and without you having taking action to do so. This can occur when an advisor chooses to end the session without notice, or, it might end abruptly because of a technical issue. If the latter, please submit a customer support form including your session information: who the session was with (advisor name), date of the session along with any error message you might have received. What if I'm not satisfied with my chat session? We want every experience on LiveAdvice to be satisfactory. If it isn't, we'll credit your Member account for the amount of the transaction, up to a limit of $25. Learn more about LiveAdvice's Satisfaction Guarantee. My question isn't listed here. What should I do? Send us a support request via Customer Support and we'll get right back to you!